Rheumatoid arthritis (RA) is a chronic progressive condition that attacks several joints throughout the body. It is an autoimmune disease in which the body’s immune system mistakenly attacks the joints. As a result, the tissue inside the joints, called synovium, begins to thicken and cause pain around the joints. Synovium is responsible for creating a fluid that lubricates the joints to help them move. Approximately 1.5 million people in the United States have rheumatoid arthritis. Symptoms of RA may include the following sensations in the joints: pain, tenderness, swelling, redness, warmth, stiffness, and loss of range. Swollen joints and stiffness are very common symptoms for those with the disease. Doctors will often use morning stiffness to measure the severity of a patient’s joint inflammation. Other RA symptoms include limping, anemia, fever, and fatigue. 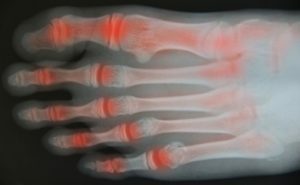 To diagnose RA, Dr. Legel may request X-rays to see how much damage has developed in the joints. Blood tests may also be performed to determine if there are any signs of anemia or antibodies present. If you have been previously diagnosed with RA, you should know the condition may also spread to your feet and ankles. There are many non-surgical options that can be used to treat RA. Some of these options include physical therapy, foot massages, orthotics, bracing, supportive shoes, and steroid injections. Physical therapy is useful due to its ability to help stretch and strengthen the joints in both the foot and ankle, improving joint function. Massages can help improve blood circulation in the feet. Choosing proper footwear will allow you to walk with comfort. Bracing can help stabilize foot joints, limit deformities, and decrease pain. In severe cases, surgery may be considered for treating RA. It is especially considered for those who cannot walk without experiencing pain and those whose deformities cannot be managed with braces. Dr. Legel will only recommend surgery if he believes it is the best option for you. Dr. Legel is currently accepting new patients with rheumatoid arthritis and other foot/ankle conditions. To schedule your visit, please call our Dallas clinic at (214) 366-4600. You may also us our online contact form located at the top of this page.